My cats go crazy for scallops as well...err, come to think of it, they love all seafood (and meat and even some vegetables). Especially Oppy, who also happens to be the more aggressive one. She will get on the counter, all up in your face and throw a hiss fit when you try to shoo her away. What an a-hole. I still love her though. Obviously scallops are at the top. On the flipside, I am not a huge fan of lobster, thankfully. That stuff is expensiiiiive. Although Phillip (aka, "the boy") and I are planning a trip to Maine this summer in the hopes of trying some Maine lobster, among other things. 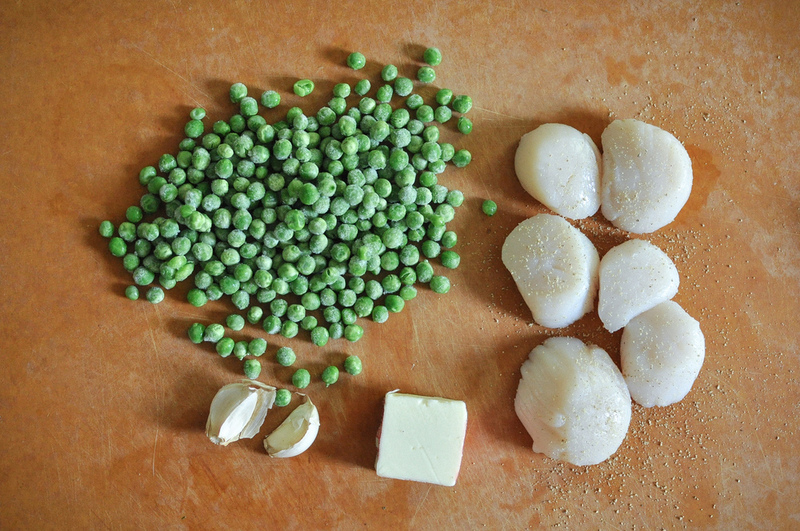 Don't skip the step of heating your pan and oil as hot as you can get it before adding the scallops. That is the key to getting a good, crispy brown without overcooking them. Heat up butter in a small saucepan, add garlic and fry for 2 minutes. 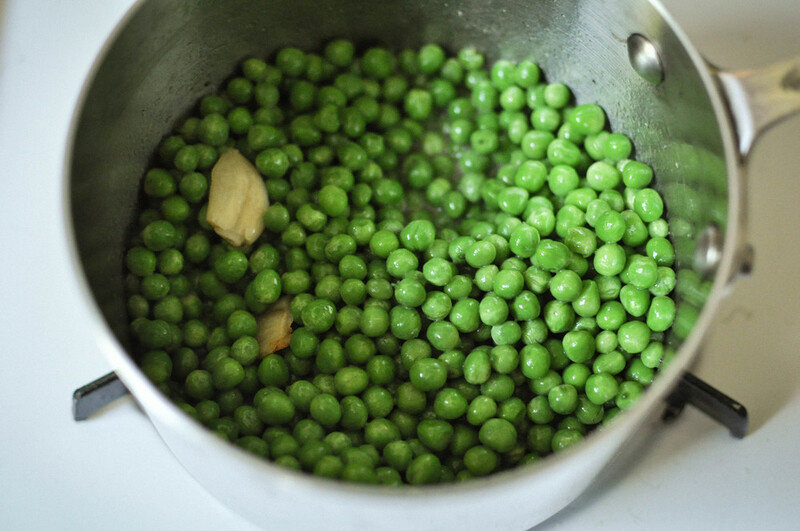 Add peas and water/veggie stock, and cook for 3 to 4 minutes. Add salt and stir to combine. Transfer pea mixture to a blender or food processor and purée until smooth. 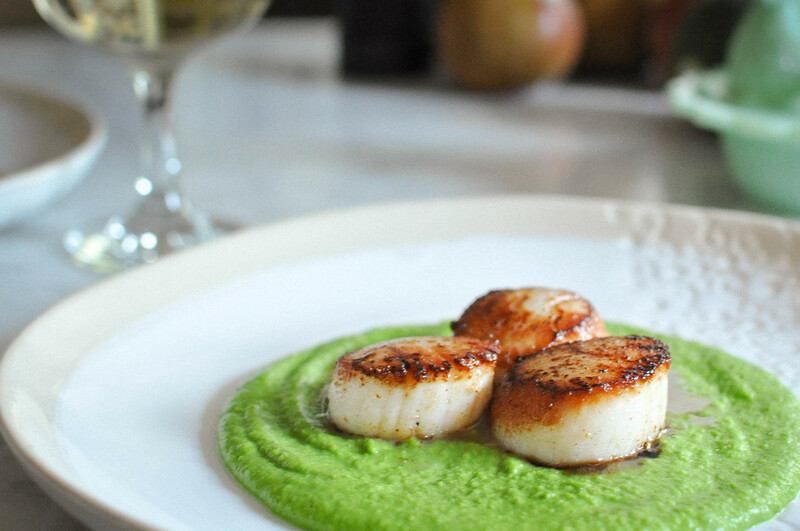 Set aside while you make the scallops. Remove the side muscle from each scallop. They peel off easily using just your fingers (feed them to your hungry cats, they will love you for it, or cook them up separately and have as a snack). 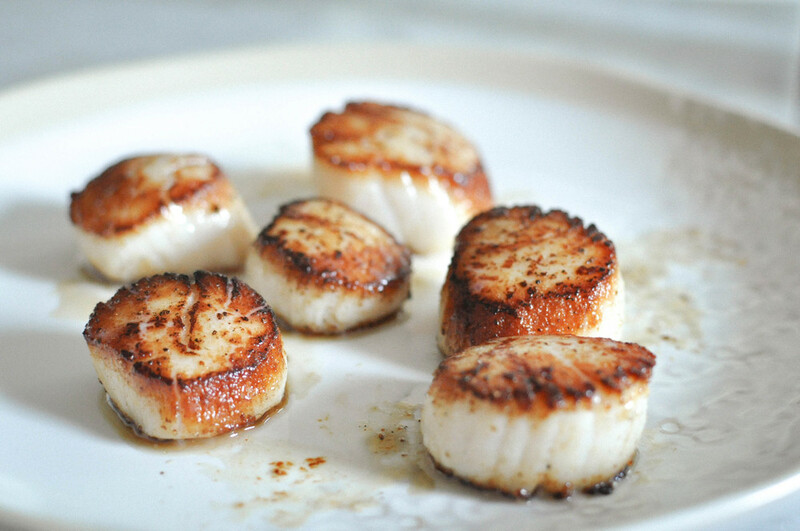 Dry the scallops with a paper towel, getting as much moisture out as possible. Heat up a large, heavy bottomed, stainless steel or cast iron skillet on high heat. Add oil and heat until shimmering and just smoking. Lightly salt and pepper scallops, and quickly but gently place in skillet, making sure they aren't too close to each other. Cook for 1 minute, disturbing them as little as possible. Flip scallops and cook for one more minute. You should have a good, slightly crispy, deep golden brown on both sides. Immediately remove from heat. 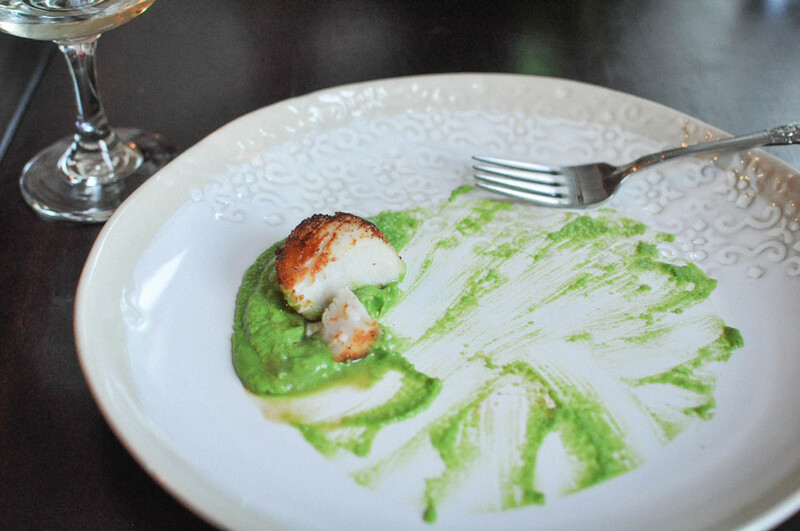 Divide the pea purée between two plates, you may not need all of it. Divide the scallops evenly, placing them on top of the purée. Spoon any extra scallop jus on top. Serve immediately.